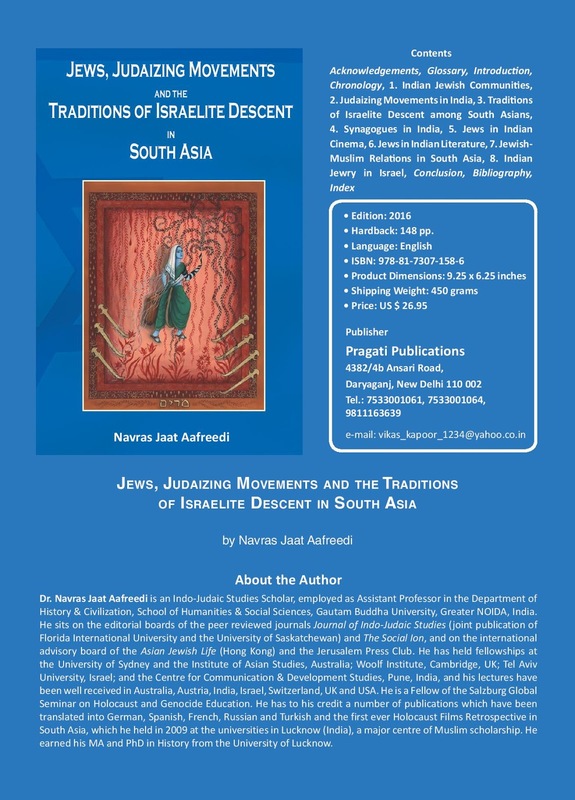 The first book ever to combine the socio-historical-cultural study of the three Jewish communities of India, viz., the Bene Israel, the Cochini and the Baghdadi, the three Judaizing movements that emerged in India during the last seventy years, viz., the B'nei Menashe of Manipur and Mizoram, the B'nei Ephraim of Andhra Pradesh and the Chettiars of Tamil Nadu, and the traditions of Israelite descent among certain sections of Muslims and Christians in South Asia and the Jewish response to those traditions. "One of the most widely discussed works on the lost tribes of humanity in recent times." "Historians...believe that Navras' research may turn out to be a milestone in the genealogical-historical research that takes place in an obscure corner of Lucknow, rediscovering a link lost in the passage of time." "A comprehensive and perhaps a landmark study of the Jews in India." "...a significant work of reference, and throughout is most interesting and written in elegant and lucid style. It is a welcome contribution to the field of Indo-Judaic Studies, and fills a lacuna in our sketchy, often shadowy knowledge of the Indian Jews and the claimants of Israelite descent in India." "An admirably lucid and elegant account of the history of Indian Jews and those groups who profess to have descended from the 'Lost Tribes of Israel'." Author: Since the publication of the book, its author Dr Navras Jaat Aafreedi has joined Presidency University in Kolkata as Assistant Professor in History. Before that he taught at Gautam Buddha University for six years and four months as Assistant Professor in its Department of History & Civilization.